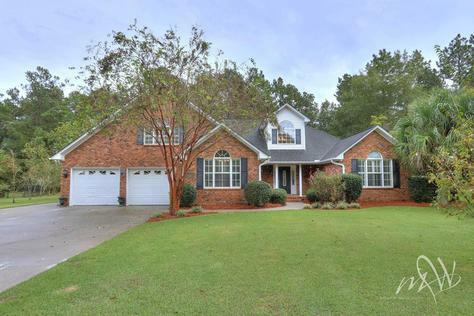 Custom home located in golfing comm w/ a wooded backdrop for privacy! Cathedral ceilings as you enter the grand foyer w/ a clear story window. HWD flooring in LR,DR, & foyer. Split plan. Kit w/ granite & lots of cab. Spacious utility w/ sink. Bonus is 4th BR w/ full bath & closet. MBR w/ trey ceil, walk in. MBath has jetted tub, dual vanities and lg walk in shower. ! of 4 BR has private 1/2 Bath.